Used in the treatment of anxiety, back pain, depression, diabetes, fibromyalgia, neuropathy, and thyroid disease. It also improve the function and conduction of neurons in diabetes, and helpful in certain liver and brain diseases. DAN 9 Sachet formulated with many effective ingredients which have magical effect on the treatment of anxiety, back pain, depression, diabetes, fibromyalgia, neuropathy, and thyroid disease. By health metabolism it build strong muscle tissue, fight against inflammation which is caused by joint pain,repair injuries. It also improve the function and conduction of neurons in diabetes, and helpful in certain liver and brain diseases. 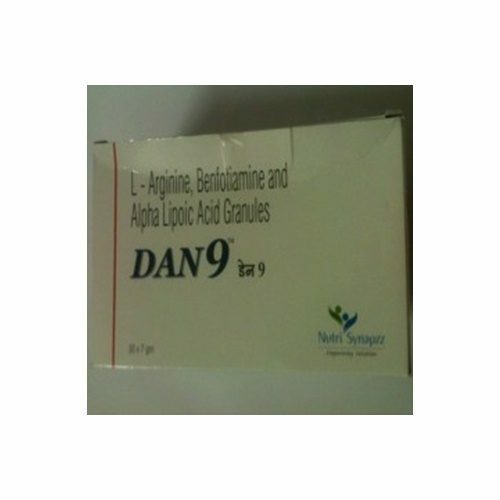 Dan 9 Sachet contains : L-Arginine (1.5mg), Benfotiamine (200mg), and Alpha Lipoic Acid (400mg) as a major ingredients. Alpha Lipoic Acid: It is an efficient antioxidant with the capacity to regenerate endogenous antioxidants which helps to prevent certain kinds of cell damage in the body, improve the function and conduction of neurons in diabetes, and helpful in certain liver and brain diseases.